North Atlantic Books, 9781583947708, 416pp. Opening with an in-depth discussion of the philosophy of yoga assisting, Part I--Foundations describes the methods and techniques of giving yoga assistance, with detailed discussions of all of the elements of yoga assisting including communicating with students, qualities of touch, the five basic steps of providing hands-on cues, hands-on positioning and stance. Part II--Applications demonstrates how to assist students in each of over 100 postures in the seven families of asanas (poses). Each chapter begins with background on an asana family and close consideration of its foundation asana. Each asana is presented in a two-page spread with photos that show how to give students effective guidance and support. Part III--Evolution offers thoughts on the further development of yoga in the twenty-first century. The author of the best-selling Teaching Yoga: Essential Foundations and Techniques and Yoga Sequencing: Designing Transformative Yoga Classes, MARK STEPHENS has practiced yoga for twenty-two years and has taught yoga full-time for seventeen years. The founder of Yoga Inside Foundation, L.A. Yoga Center, and Santa Cruz Yoga, Stephens has trained over 1,200 yoga teachers. At Yoga Inside Foundation, he trained and supported yoga teachers in over 300 alternative settings across the U.S. and Canada, receiving Yoga Journal's first Annual Karma Yoga Award in 2000 for this work. "Whether you're in training to be a teacher, just starting your teaching career, or a veteran with many years of experience, Mark Stephens' Yoga Adjustments will prove to be an invaluable resource. As with all his work, this book is written with intelligence, insight, and integrity." "I'm very excited about Mark Stephens' new book, which offers an invaluable service to the yoga community—teachers, aspiring teachers, and yoga students. As yoga's popularity grows, we need our yoga teachers to mature as well, and Mark has given them a superb guidebook for making smart, safe, clear asana adjustments that further our understanding and deepen our experience of yoga. In this way, the benefits of Mark's expertise extend beyond the yoga community by demonstrating how healthy environments can be created in which anybody can practice yoga with confidence." "This book is an important contribution to the ongoing evolution of yoga teaching and practice. Hands-on adjustments provide a quick and amazing two-way communication stream between teacher and student. Used with or without verbal cues, they can bypass most abstract theory and induce good alignment to reveal how a pose might feel when balanced, open, flowing, and free. Conversely, adjustments can be mechanical and even manipulative, seductive, and harmful. Because of this powerful potential in both ways, we all need to look intelligently at their mechanics, purposes, and ethics. 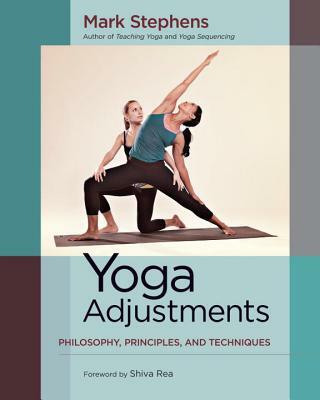 Stephens' Yoga Adjustments is a wonderfully detailed resource for our investigation." "As someone who is regularly called upon to treat yoga students injured by ill-informed teachers, I can confidently say that Mark Stephens has done our community a wonderful service with his newest work, Yoga Adjustments. Along with Teaching Yoga and Yoga Sequencing, this book forms a trilogy of essential works for every yoga teacher who strives to be more sensitive, safe, and effective in their teaching." "Another monumental and much-needed work to guide yoga teachers in making safe and effective hands-on adjustments with their students. Once again Mark Stephens raises the bar and accelerates the evolutionary path of modern yoga. This book is an invaluable reference for today's and future teachers." "Just as a good massage feels great and is healing, and a bad massage can be annoying, even painful and unpleasant, so it goes with hands-on assists in yoga. May this book encourage healing touch! Thank you, Mark, for making this information so accessible and clear!" "I love that Mark Stephens has covered not just the biomechanics of hands-on assists and the spectrum from technical support to subtle energetic direction, but also the internal dynamics and ethics that the power of touch brings up in people of all walks of life. Mark offers practical insights, including the many dimensions of respecting a person's process, injuries, and tweaks, and the important boundaries that are necessary for entering this territory that is often like being a 'midwife of the embodied experience.' Mark brings understanding to the somatic power of touch and the role of hands-on assists in the unfolding of yoga. This is a book that will surely be serving teachers for a long time." "We generally think of touch as from one person to another. In this book, Stephens reminds us that we must first be 'in touch' with ourselves and with our own yoga practice before adjusting another person's pose. Overall, the book focuses on practical application of adjustments, based on fundamental elements of an ethical personal practice. On asanas, Stephens states that the teacher should understand 'their benefits, risks, contraindications, preparatory asanas, alignment principals, energetic actions, common challenges, modifications, use of props.' Quite thorough, the step-by-step examples are threaded throughout with groundwork in both Western and yoga philosophy. It is a pleasure to read." "Finally, the book I have been waiting for—a clear and thorough guide to hands-on assisting in yoga. Mark Stephens takes us from the guiding principles of touch, observation of students, and establishing intention for touching, through to specific verbal cues and hands-on instruction to support those cues. For teachers, he offers stances to safely ground ourselves while adjusting a student along with terminology for clarifying the various ways of touching for maximum effectiveness. Additionally, Mark provides clear guidance on how not to touch. All of this culminates in a comprehensive index of poses with verbal cues and clear photographs explaining the various options for hands-on assistance to provide greater alignment in the asanas. Never before have we teachers and students had such a concise guide available to us." "A must-read for any yoga teacher looking to expand and deepen not only their knowledge of adjustments, but also of teaching asana as well. The level of detail and knowledge presented here is phenomenal."